I have recently been viewing so many unbelievable DIY blogs. They keep your wheels turning and mind spinning on what you want to do in your home. Right now I have a project in mind that I thought I would share. This is my bathroom. When we built this house 15 years ago the budget was tight. I found this triple dresser for $15.00 at a yard sale and challenged my dad with the task of making it into a sink……….I used dressers for sinks and vanities before it was cool, it was just economical. Â The drawer fronts being changed into doors were a bit of a challenge and need some up dated hinges and help. One of the blogs that I have been drooling over is called “The Frosted Gardener”. BEAU-TI-MOUS TRANSFORMATIONS of ordinary or castaway furniture pieces. This was their before…… this is the link to her awesome blog….. Ya think???? She gives the tutorials….she makes it look soooooo easy…….. I think I can do it……………..
Do you think it would be too dark in my bathroom? Eeekk!Â Give me your thoughts! Should I just start with the mirrors? I am going to do my window treatments last when I decide how I am heading with my vanity….. 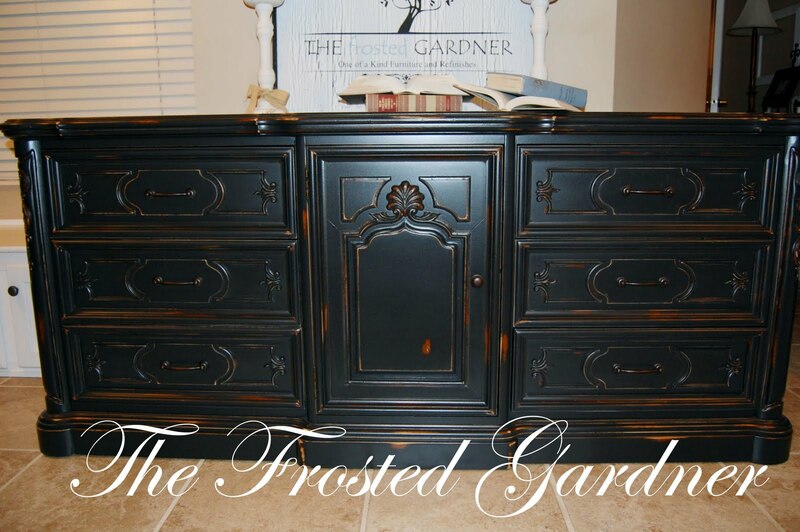 Check out her before and after’s…..
You’ll be looking at your moms old dresser much differently. Â Tell me what you think! Yes it can be done. I just basicly did the same thing to a very budget oak bathroom cabinetin my girls bathroom. It turned out pretty good. I just put some cute brushed handles on it as well. I say go for it! Amber, did you distress the look? Thanks so much for your support. Is this life group amber? I am thinking I am gonna do it! Eeeeeekkkk! Wish me luck! Yes it is Amber from Life group. And yes we distressed it. Not too much though. I tell you it sure gave a cheap oak (yuck) bathroom cabinet a little pep. Good luck! Hey there! Thank you so much for your appreciation of our furniture makeovers! You are a sweetie! You should do it. You really really really should. I don’t think it would be too dark. One black piece can be a nice focal point and not distract from all of the light bouncing in the windows and off the mirrors. Good luck! Then that settles it ; ) Don’t know if you want credit that I’m using your tutorials until we see what it looks like! Thanks! What a sweet thing for you to stop by and say. Love, Me.